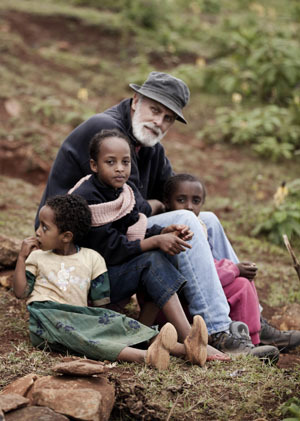 In the late 1990s, Dr. Larry Thomas was working as an emergency room physician, when a colleague invited him to Ethiopia. A decade before, Thomas had studied tropical medicine in London and he was curious to explore the geographically complex African nation. What he found would change the course of his life. "That was my introduction to the desperate situation of the people in Ethiopia," said Thomas. "While I was over there, I saw all of these people with these massively disfigured feet. At the time, they thought it was caused by an infection by a worm but later they realized it was coming from the soil." Podoconiosis (Podo) is a disfiguring and debilitating disease that causes elephantiasis of the feet and legs. It is caused by a tiny silica fiber in red clay, a fiber too small to be seen with the naked eye. "It goes up into the lymphatic system and causes inflammation and ultimately scarring and then it doesn't drain properly," said Thomas." Podo is usually found in areas with high elevation, high precipitation and extreme poverty. The disease is made worse by superstition and the false belief that Podo can be "caught" by stepping in the shadow of someone who has the disease. "You can imagine walking down the street and having everyone take a big step around you so that your shadow doesn't hit them," said Thomas. "A lot of those people think they have a demon so they hide. They're embarrassed because of their condition." If left untreated, Podoconiosis can require amputation and may even lead to death but it has a simple solution. Podo can be prevented by wearing shoes. While there is no cure, the swelling can be reduced dramatically with soap, dilute bleach, antibiotic ointment, shoes, socks and pressure dressings. If children wear shoes, the disease will not develop. "Simply by providing shoes, we could have a positive impact on these people's lives," said Thomas. One million people in Ethiopia have podoconiosis, one out of every 83. No one knows how long the disease has been around but the World Health Organization only recognized it as a neglected tropical disease in February 2011. "Nobody really knows about it and nobody really cares," said Thomas. "This is not a disease that most people get." In 2006, Thomas founded the Tropical Health Alliance Foundation (THAF), a non profit organization with a mission to helps provide educational training and medical assistance to people living in the poorest conditions. Much of THAF's focus is in Ethiopia. Thomas says he was drawn the complex problems faced by the Ethiopian people because the solutions are often uncomplicated. "The thing that impressed me was that you could do so much there with so little," said Thomas. "You could make great improvement for so little money." Another serious problem with an inexpensive solution is in the removal of cataracts. Cataracts are clouded areas on the lenses of the eyes and they are the most common cause of blindness in the world. "It's a little unknown why they get these cataracts but they are devastating," said Thomas. "I just saw so many people that were blind and these children leading them around." The children are assistants. 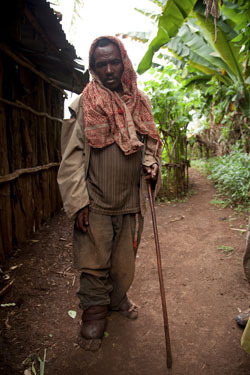 In Ethiopia, when a person goes blind, they need help getting around. This help most often comes in the form of a young relative, usually a girl, who is forced to put away her childhood and leave school in order to help. When the old person dies, the child is left with no childhood and no education," said Thomas. Thomas said 80% of cataracts are treatable and curable for a very low cost. "We can restore vision for fifty dollars," said Thomas. "The average adult in America has enough in their pocket to restore vision to a person in Ethiopia. That's enough for a blind person to see and a child to be liberated." 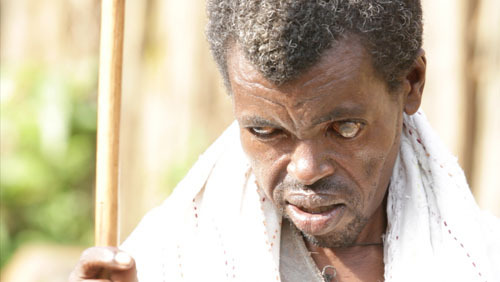 Ethiopia has one of world's largest percentages of people with cataracts. It also has fewer than 2,000 doctors in the entire nation, nearly all of whom live in the capital city of Addis Ababa. It is difficult for people outside the city to find or afford medical help. Thomas spoke of a time he helped arrange treatment for an Ethiopian mother in her early 30s. "She had gradually lost her vision due to cataracts," he explained. "She had given birth to four children but she had seen only two of them." After surgery, the young mother regained her sight and was able to see her children. "I think that that second on planet earth, it was the most amazing thing that was going on." Along with their eyesight, entire lives are restored. "They can be productive," said Thomas. "They're not a burden to society. They can work again and to see that from the periphery is just amazing. An additional area of focus that enhances the life of young people is the repair of obstetrical fistula. A fistula is a tearing of a woman's internal tissues during the birth process that results in incontinence, loss of body functions that is so severe, the women are ostracized and forced to live in isolation. According to the World Health Organization, 100,000 women in Ethiopia suffer from fistula and 9,000 more cases develop each year. One reason is the lack of doctors and midwives. Another is the fact that young girls are married off at an early age. The United Nations International Children's Fund reports that many Ethiopian girls are forced into marriage at age seven or eight and become pregnant when they first hit puberty, before their bodies are mature enough to give birth. Fistula can be prevented and is treatable but it is often difficult to find the women who need help. Thomas's organization has a team of individuals in Ethiopia, a group of heroes who seek out women who need assistance. "They're the ones who go out and find these women and clean them up and bring them in," said Thomas. Thomas credits the Ethiopians for doing much of the work and coming up with the resources. "They provided us a clinic to work in. We bring in the doctors and the medicine," said Thomas. "We couldn't manage without them and they're appreciative of our help as well." Thomas said he's grateful for the opportunity to work with the people of Ethiopia. "It really changes you," he said. "The opportunity. The opportunities are infinite and it's just wonderful to be a part of it." Tropical Health Alliance Foundation - "helps people in the Majority World live healthier and more self-sustainable lives by providing medical assistance, educational training and poverty reduction." TOMS Shoes works with Dr. Larry Thomas - "TOMS Shoes loves Dr. Larry"
TOMS Shoes - is a company founded by Blake Mycoskie that will match every pair of shoes purchased with a pair of new shoes given to a child in need.